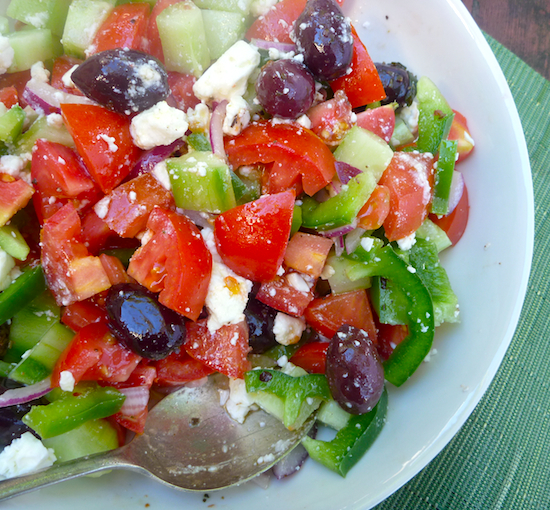 Greek salad is something I’ve eaten a lot of over the years. It’s a classic salad that I love, but when I order it out at restaurants it’s more often then not, a disappointment, made with second rate feta and flavorless tomatoes. When I make a Greek salad at home it’s something I would never use a recipe for but I was looking through George Calombaris’s book Greek Cookery from the Hellenic Heart and his take on the classic Greek salad – horiatiki salata or village salad. There was nothing revolutionary about George’s recipe for Greek salad but there were a few things that were different from the way I would usually make it at home – George’s recipe called for red wine vinegar instead of lemon juice, green peppers instead of red and a sprinkle of dried oregano which is something I would probably never use in salad. On the weekend I tried making the salad George’s way and it was good really good, better than my usual version of Greek salad. The red wine vinegar gave it more of a robust kick and the green peppers were crunchier then then red peppers and gave a better texture and flavour contrast to the sweetness of the tomatoes and cucumbers. This is a classic salad that is worth revisiting. Use a nice, crumbly proper Greek feta and you can’t go wrong. 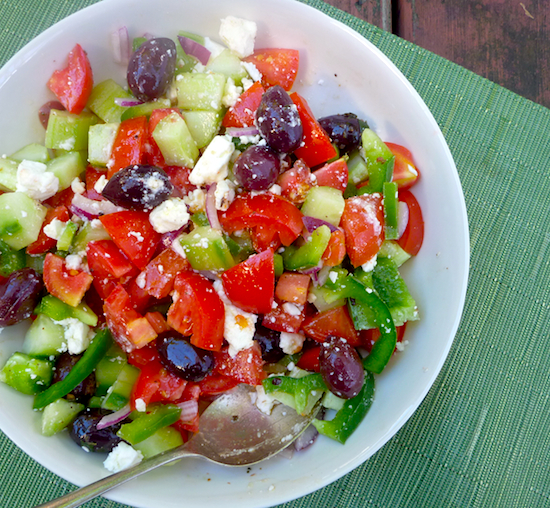 Mix together tomatoes, cumber, onion, capsicum and olives in a salad bowl. Dress generously with olive oil and red wine vinegar to taste.